Saintly inspiration: A young Dominic Murphy at the Darjeeling Orphanage in February 1991. DOMINICAN Father Dominic Murphy can never eat a curry without thinking of a tiny Albanian nun, now known as St Teresa of Kolkata. In 1990, Fr Murphy had travelled to Kolkata to work with the Missionaries of Charity, the order founded by Mother Teresa. “In 1988 to 1990 in Melbourne, my vocation to the order began to take shape, but I thought joining in the order in Australia is too easy,” Fr Murphy said. The nurse felt drawn to work with Mother Teresa’s order in Kolkata, where he had visited two years earlier. After gaining permission from the Dominicans, Fr Murphy took nine weeks off and found himself in Kalighat, the Home for the Dying and Destitute founded by Mother Teresa in 1954. His first encounter with the famous nun who loved the poor was on Christmas Day, 1990, and she was running late to a Mass with the volunteers and home patrons. After the Mass she went around to meet all the volunteers. “I went to give lunch to one of the men,” Fr Murphy said. “I see Mother Teresa and she motions for me to come forward, takes the plate of food from my hand, mixes the curry with the rice, puts a spoonful in the man’s mouth, then turns to me and says, ‘You must mix it’ and walked on. The second encounter with Mother Teresa was on New Year’s Day, when the foundress went to greet all the volunteers working at Kalighat. Fr Murphy remembers Mother Teresa’s joy and noted her sense of humour, but there was one part of her talk that made him uncomfortable. “She said ‘When you look after these people, I want you to see the broken body of Christ, I want you to take your hand, and on your five fingers say, ‘You did it to me’’,” he said. “So what was happening in me? … my nursing training was to look after people but be professional, don’t get too emotionally involved. “I tried that by default without even realising. “I heard her very clearly – ‘I want you to love these people’. “I was doing things functionally, because I didn’t want to be sad when they died. It wasn’t until Fr Murphy’s final weeks at the home that he discovered the power of seeing Christ in the poor. A man who had been left for dead on the side of the road was admitted to the home and Fr Murphy was asked to care for his wounds. The elderly man was dying of tuberculosis and malnourishment, and was also suffering from pressure wounds from lying on the ground. “They wanted me to dress the wounds; I didn’t want to hurt him,” Fr Murphy said. “I got the bandages and dressed the wounds, removing the dead flesh – it was a pretty ugly procedure. “He winced so I did hurt him. “Afterwards I went into the chapel and I had a cry. The emotional impact of Kolkata and Mother Teresa’s words has since stayed with Fr Murphy, who can still hear her voice when he reads her famous quotes. 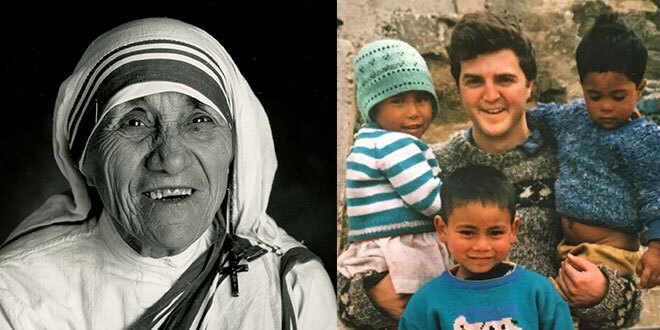 While Fr Murphy has not been back to Kolkata since his ordination, he was given an opportunity to meet Mother Teresa one-on-one as a student brother, but declined. “I felt it was too self-indulgent – I knew how little time she had and I felt I had taken up enough of her time,” he said. One day he hopes to return to visit the sisters and offer Mass for them. On Mother Teresa’s canonisation, Fr Murphy said most people who had met her believed she would be called to sainthood. “She remains a special person to me,” he said. “When I met her I was 25 and making the move into the priesthood. “It was fascinating, especially of her really asking me to get real with what I was doing there (in India).